If you have children, you probably have already turned your water heater down to a safe 120 degrees Fahrenheit, but did you know that this can also save you money? Dropping the temperature just 10 degrees can save upwards of 3-5% on energy costs. You likely won’t even notice the change. Window coverings offer some added privacy and can also can boost your home’s energy efficiency. In the hot summer months, closing your blinds, curtains, or shutters will prevent the sun’s heat from also warming up your home. During colder times of the year, opening these window coverings during the day can help utilize the sun’s energy to lessen the load on your heating system. Did you know that lighting accounts for about 5% of your power bill? These days, energy-efficient light bulbs offer many choices when it comes to colors and light levels. Not only do they use less power to run than traditional incandescent bulbs, but some types are capable of putting off more light too and take less energy to do so. 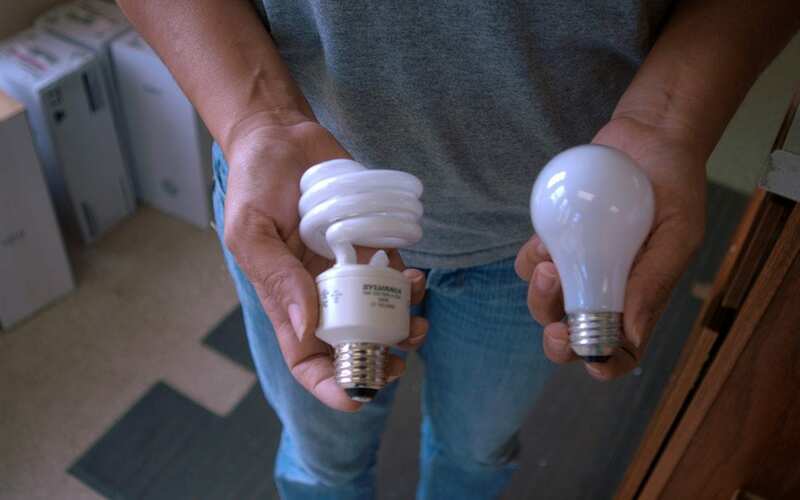 Start by switching main light sources in your home to bulbs that have an ENERGY STAR rating and you will notice a difference in your power bill. We have more electronics in our homes than ever before, and these items may be costing you more than you think. Our TV’s, computers, cable boxes, and other electronics often use power to stay in “standby mode” even when you have powered them off. Additionally, many of our charging cables can do the same thing when left plugged in. This meaningless use of power is called phantom load, standby power, or vampire draw, but all of them mean the same thing: paying for power when you aren’t using it. To boost your home’s energy efficiency, simply unplug these chargers and large devices when not in use. One easy way to monitor this is plug everything into a power strip with an on/off switch and keep it off when you aren’t using those devices. If you find lights often get left on in areas such as closets and bathrooms, installing a motion sensor might be a great solution. These sensors are installed in the light switch box and work by turning the light on or off when they detect someone entering or leaving the room. Timer switches can also be beneficial, especially on ceiling and bathroom fans since those are often forgotten long after they’ve done their job. Be sure to have a professional electrician handle installation if you aren’t comfortable with electrical systems. Can you feel a draft coming in from under your doors? This common problem can be easily solved by installing new weather stripping, a draft cover, or even by simply using a rolled-up towel or a draft snake to block the air. This quick fix can really help boost energy efficiency in your home for a minimal investment. By simply taking notice of how your home is using energy and then taking a few easy steps to help correct issues, you can easily boost energy efficiency in your home without having to break the bank to achieve it. Home Guard Inspections is a professional home inspection company in the Bismarck-Mandan area of North Dakota who uses thermal imaging during home inspections for a deeper evaluation of the home’s energy efficiency during home inspections. A thermal imaging scan can detect areas of air loss and also pinpoint electrical hotspots that may be wasting energy. To discuss our services, contact us here!